2018 was a big year for Amani Haydar. 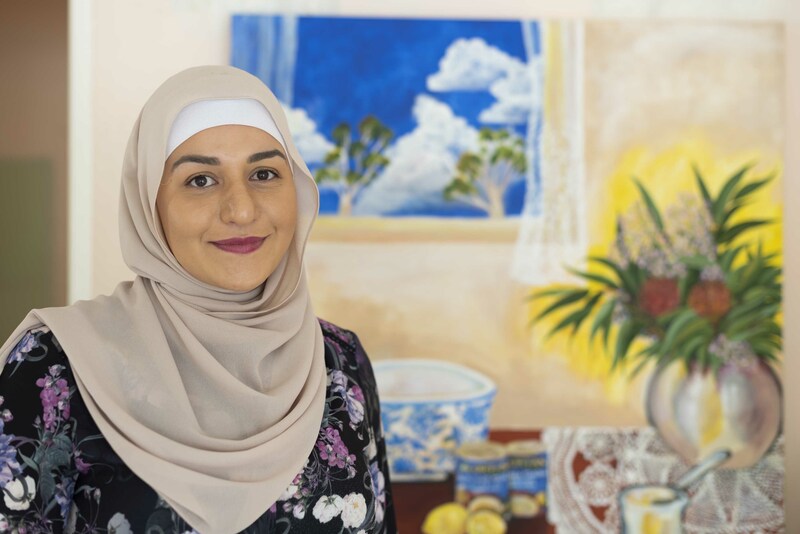 As a lawyer, Bluethumb artist and Archibald Prize finalist, Amani has gained growing popularity and respect for her paintings and illustrations, which frequently depict women expressing bittersweet emotion. Her self-portrait, ‘Insert Headline Here’ was a finalist in the 2018 Archibald Prize and her painting ‘The Plight of the Victims’ was a finalist in the 2018 Law Society of NSW Just Art Prize. At a crucial time for movements concerning women rights across the world and clear cultural and social disparity, Amani’s inspiring story is essential to be heard. 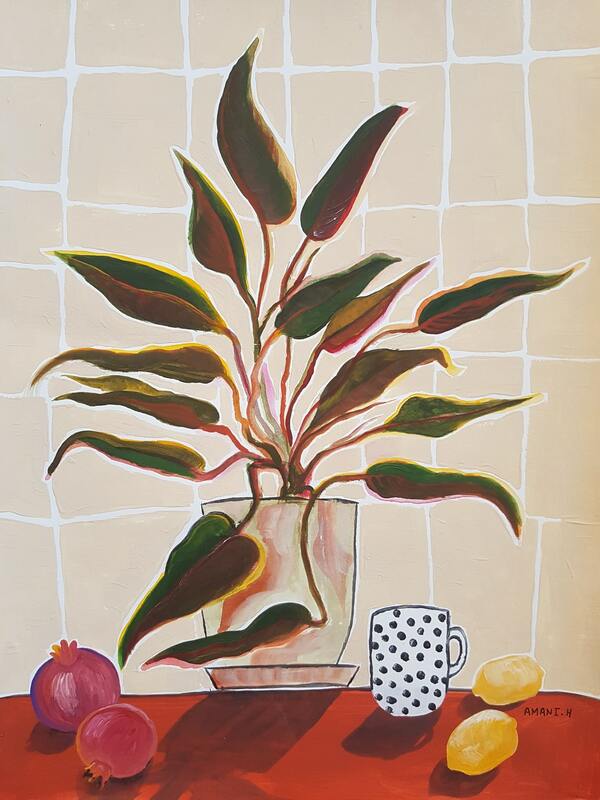 Houseplant in Afternoon Sun was one of Amani Haydar‘s earliest works featured on her Instagram. 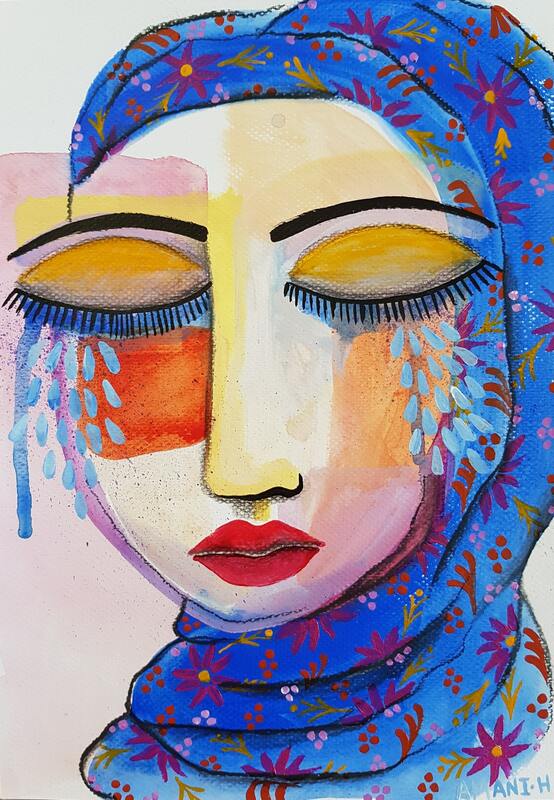 Having lost her mother to domestic violence in 2015 and her maternal grandmother in an Israeli airstrike in Lebanon in 2006, a sense of loss and grief from those events informs Amani’s art. She also speaks, writes and advocates on the issue of violence against women. By entering the Archibald Prize last year, her self-portrait Insert Headline Here was her way of honouring these women and drawing attention to the ways in which women’s lives are impacted by trauma and violence. Centred in the middle of Insert Headline Here sits a Fairfax photo taken in 2006 of Amani’s grieving mother, which circulated the news upon her death. By printing the photo out and incorporating it into Amani’s self-portrait, she took back her personal story. 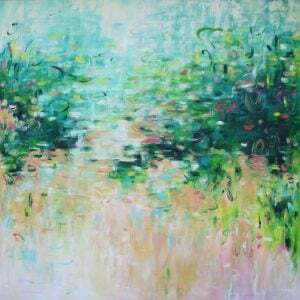 Feelings of loss and despair consequently meet with bold colours and tones that signify strength and hope. 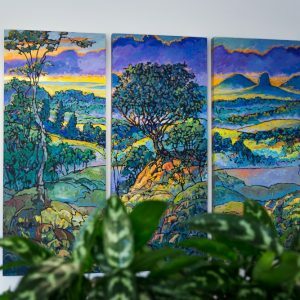 Painting mainly with acrylic paint on stretched cotton or linen canvas gives Amani the flexibility to work from home. 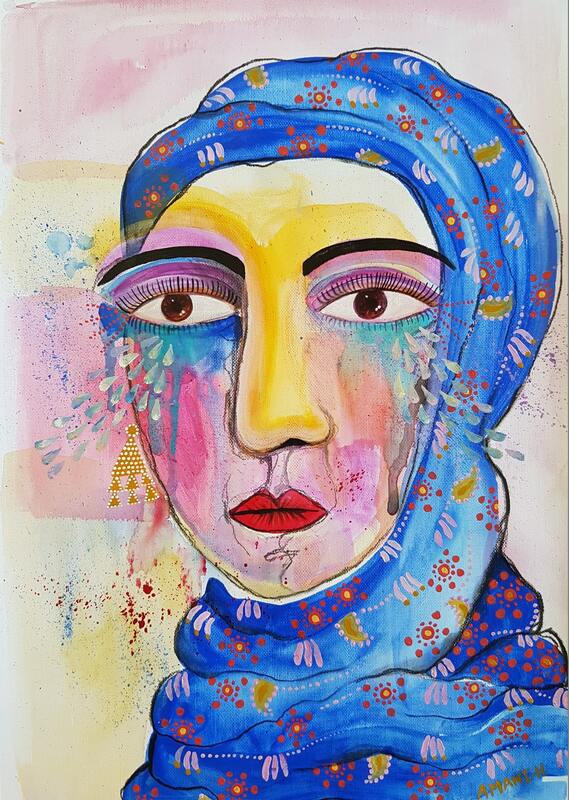 “I also paint on paper, especially for my smaller works and I enjoy the textures that can be created on paper.” Amani’s work shows depth with collage, charcoal, ink and pencil in a variety of pieces. 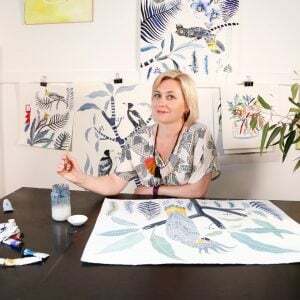 Her illustrations, which have been featured in online news articles, are made traditionally before being scanned at a high resolution. 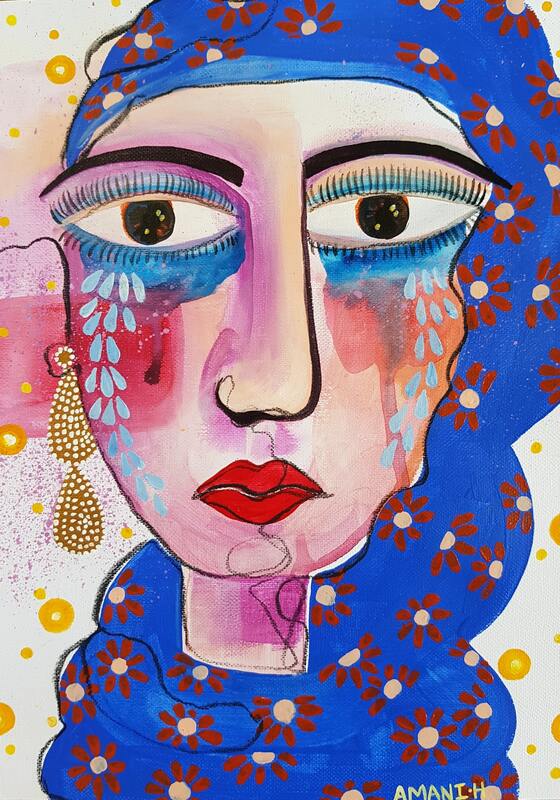 Fearless in Blue IV is similar subject matter to Amani Haydar’s illustrations featured in various online articles. 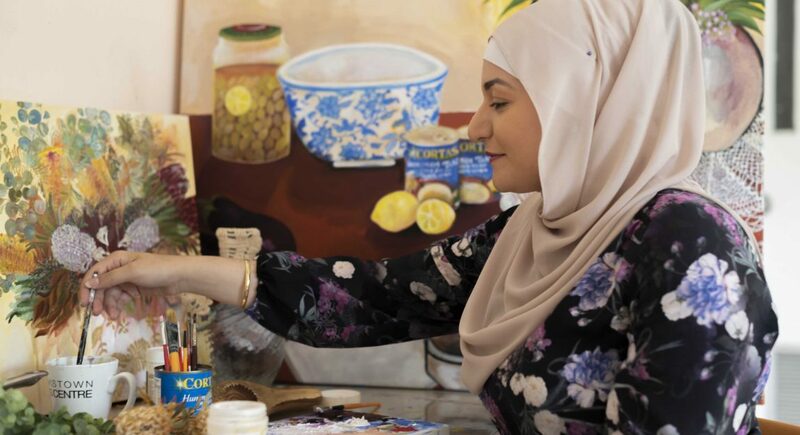 Being an artist allows Amani to tell her stirring stories and connect with others. 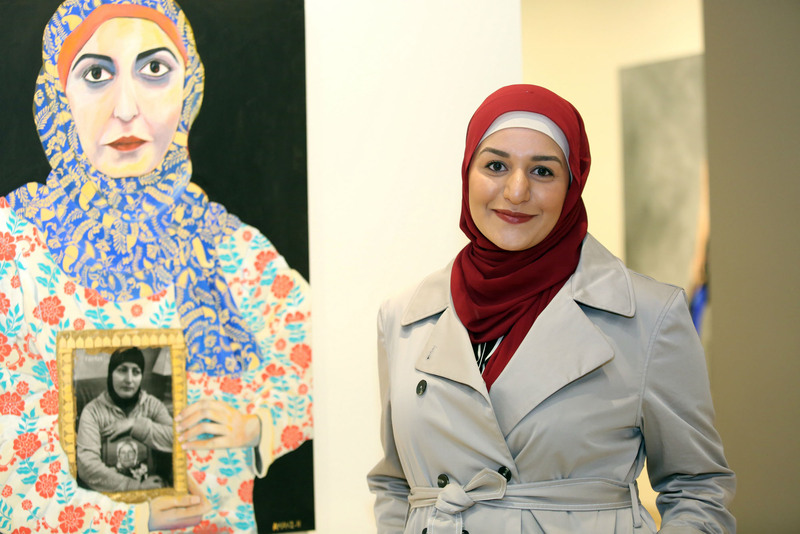 Many of her collectors have connected with the messages in her work – a connection that Amani describes as invaluable. 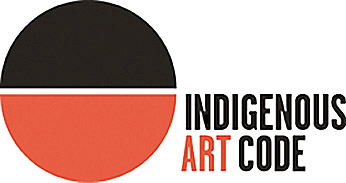 “Art is a powerful tool for self-expression and communicating ideas. It feels natural and free and yet it has allowed me to engage with difficult topics and contribute to important conversations.” While a lot of Amani’s work centres on violence towards women, she has also contributed to the All We Can’t See project, in which artists were invited to illustrate incidents from the Nauru files, resulting in a gut-wrenching but powerful collection of works. Amani Haydar is far from the finish line and has even bigger plans for 2019. 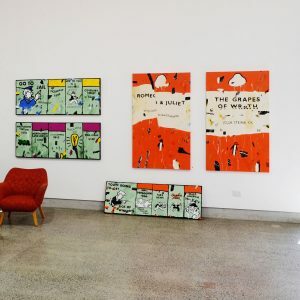 As a resident at the Bankstown Arts Centre in a pop-up art space called Incubate Artists Studios, the work she has produced during the time of that residency has been exhibited since 2 January 2019. 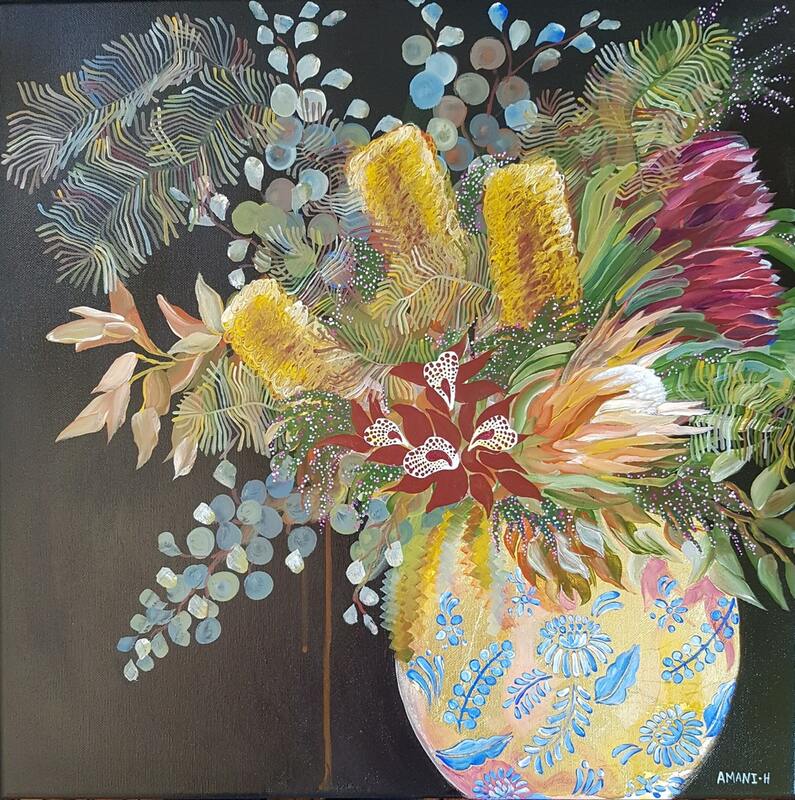 “I am also looking forward to continuing to challenge myself by entering art prizes and I aim to have my first solo show at the end of 2019 – although I can’t give away the details of that just yet!” Browse Amani’s portfolio here. A very similar story to my own. My experience of The Archibald was entering a portrait of David Edney Children’s Representative Family Law. 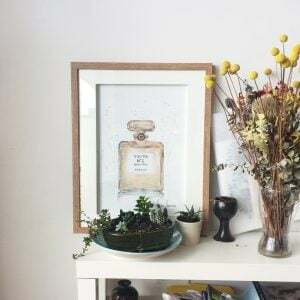 Sometimes the use of an image to express your speech is much more convenient than using words, and we can express our feelings using colors and pictures, and this is very beautiful.